Whether you’re ready to build your own dream home or embarking on a commercial development project, Texas Ace Land Clearing is ready to provide you with dependable, efficient land clearing services in Houston. In preparing your land for construction, development or other growth, there are a wide variety of options. While the traditional method of using heavy machinery to remove and haul debris offsite is an option, hydro-axing, also known as hydromulching, is another innovative service that can save money. In the land clearing industry, hydro-ax mulching has introduced a highly efficient method for clearing out trees, undergrowth and more in a fraction of the time. Also known as hydro-axing and simply hydromulching, this technique uses powerful machinery to quickly turn trees into mulch where they stand. Rather than the outdated method of bulldozing an entire space of land, hauling away the debris, disposing of it, and then possibly repairing damaged soil, hydro-axing completes all of these steps at once. Read more. Under brushing is a technique used to clear underbrush including bushes, saplings, tall grasses and weeds from a lot of land, while keeping the mature trees intact. At Texas Ace Land Clearing, we will often use this method in preparation for lot when it’s not necessary to completely clear the land. Another term for under brushing is bush mowing, and it’s a great way to clear smaller sized lots with substantial overgrowth, in order for the land to be used as a backyard, pasture or a shaded, wooded area. Heavy-duty brush mowers are used to to remove unwanted overgrowth while maintaining the allure of mature vegetation. Read more. While under brushing is great for ensuring mature vegetation remains intact, sometimes developments in the Montgomery County and Houston areas call for the removal of, or the thinning and trimming of trees. Here at Texas Ace Land Clearing in Houston, we’re happy to provide this service to our clients. Our team of experts are able to help you through the process of removing mature trees from your property, so that you can use it for your development needs. Other times, you may simply need mature trees to be trimmed and thinned out in order to achieve the landscaping aesthetic you’re trying to achieve. We are happy to continue serving Montgomery and Houston with their tree removal, thinning and trimming needs. Read more. Many land clearing projects in the Houston area need the removal of metal, trash and a wide-variety of debris. At Texas Ace Land Clearing, we offer an array of services to help you clear the junk off your land, providing you with a no-hassle solution. We strive to ensure that your land is clear of any trash leftover from the clearing process, as we are committed to cleaning up your land with the utmost attention to detail. Read more. At Texas Ace Land Clearing, we are pleased to offer both commercial and residential site preparation services in Houston. There are several ways in which we can go about preparing your site for building or development, and we will help you make the right decisions for your land, from start to finish. Whether we need to bring in heavy machinery to fit your needs, or if we can use money-saving technology like hydromulching to get the job done, we’ll assist you through every step of the process. Call the professionals of Texas Ace Clearing in Houston to handle all of your site preparation needs. Read more. 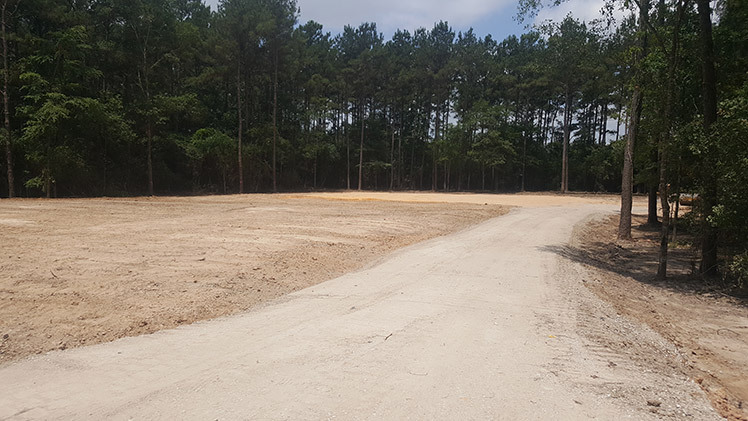 In the land clearing process for Houston customers, there are times when you may need grading, leveling or trenching services in order to meet your development goals. The professionals with Texas Ace Land and Clearing are experienced in assisting customers with all of their grading, leveling and trenching needs. We can help you make the decisions about how to go about getting the most value out of each service, and we’re happy to serve the Montgomery County and Houston areas. Read more. At Texas Ace Land Clearing, our wide variety of land clearing services in Houston are customizable to each client’s needs. Our experts are here to help you navigate the process of land clearing in Montgomery County, as well as make the tougher decisions when clearing land for your development or build plans. Contact us today to see what we can do for your land!